The IBM 4610 SureMark Printer Model TG3 is identical to the TI3 except the color is Iron Gray. 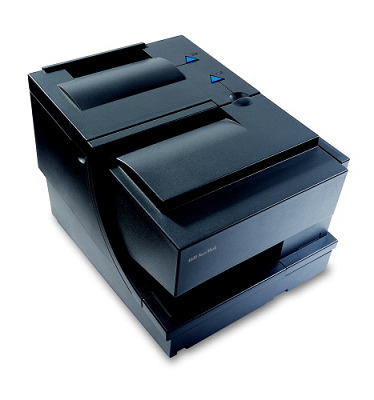 It features customer receipt and document insert printing with two-step check franking and printing. This model prints at 52 lines per second and offers support for TrueType fonts. It is capable of printing color thermal papers when the latest firmware is installed. This model can be attached to IBM system units via RS485 or USB interface adapters and it may be attached to other POS manufacturers terminals or PCs via RS-232 or USB. The choice of adapters must be selected during the initial order. This is a two-station model.